Catch the Wave… this weekend! I’m very much looking forward to the studio visits that this coming weekend will bring. I thoroughly enjoy chats with old friends and getting to know new acquaintances… for which The Wave Artists Studio Tour provides the perfect opportunity. Please drop by my studio in Winnipeg Beach on Saturday or Sunday (4 or 5 September)—I’m number 13 on the tour map… look for the blue and white sign posted on Highway 9 to catch the turnoff (at the Lady of the Lake Church on Lake Avenue)… follow signs to the flag (and the unmistakable white picket fence) at 275 Eaton Street. 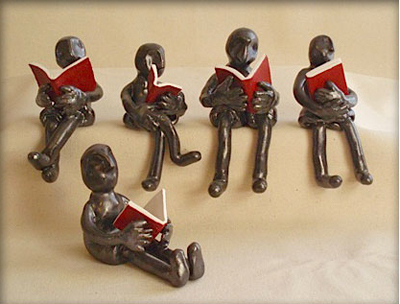 “Readers” have proven to be particularly popular since I introduced them late last fall. 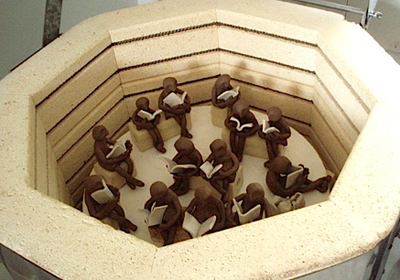 Dozens of new ones have emerged from the kiln and are now buried in their books, awaiting empathetic bibliophiles and bookworms.